Ben LoCasio '20 sat down with the Justice to talk about how his passion for coffee fueled his first business venture-- Cafe Undergrounds. He has big plans for the Cafe this semester. What does a day in the life of a Brandeis librarian look like? Laura Hibbler has the answers. A panel of financial experts spoke to IBS students about the current state of the economy and why they should care. 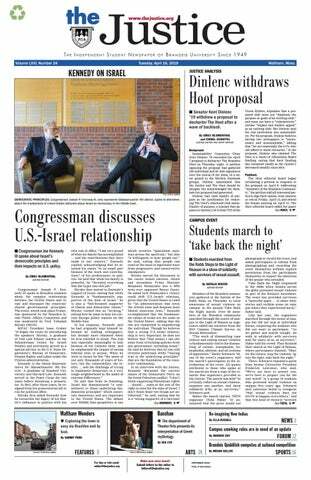 There can be a lot of uncertainty when it comes to Greek life at Brandeis, so Features reached out to all the fraternities and sororities on campus. Here's what we found. Brandeis Boxing Club president, Sonor Sereeter '19 talks about the about the club's humble beginnings, the motivations of it's members, and where its heading. In an open forum on sexual harassment/assault, students and faculty discussed the resources available on campus to help those seeking safety and justice. This is the fifth installment of “For Us by Us: The Untold Stories of People of Color on Campus.” I wanted to write this piece to highlight people of color on campus. To create a space for our accomplishments, hardships and experiences. To be recognized and acknowledged. To expose ourselves to other cultures, religions and to each other. To realize that we are not alone in our experiences or on this campus. To continue these forms of communication and to hopefully develop new ones. What do CAs Actually Do? Two CA's talk about what the job entails and how they handle the pressure of looking after their fellow students. Wellesley College Professor Susan Riverby discovered and helped bring a shocking syphilis study to national attention. Emily Bryson '19, took home an All-America award last week for her first place win in the 3,000 meter NCAA race. A panel of Brandeis faculty discussed how "rankism" effects both teachers and students on campus. The History of Ideas Program hosted a movie night with a screening of "The Leopard" with Burt Lancaster. In an interview with The Justice, Elliot Maggin '72 talks about how he took an essay he wrote at Brandeis and made it into a comic book that was published by DC Comics. Mathias Boyar '20 has just released his first EP on Spotify and iTunes. He sat down for an interview with The Justice to talk about his creative process and the reception his music has received so far. Two parents talk about how they met their significant others while at Brandeis. Nadia Alawa saw the violence and devastation caused by a civil war in Syria and knew she had to help. So she founded NuDay Syria, a multi-million dollar humanitarian relief organization that sends supplies to women and children in Syria. A panel of women artists discuss how they remember the Holocaust and why sharing stories from survivors is so important today.